Can you believe it? 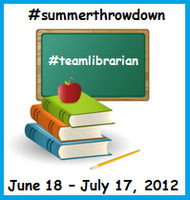 We're already at the halfway point in our first summer throwdown competition between Librarians and Teachers! So, what's new with #summerthrowdown? There's a brand new column on the spreadsheet to recommend a FAVORITE BOOK READ this summer! Yep, that's right! We're kicking it up a notch with best book recommendations!